This has been a very hectic summer with many commitments, including speaking at various conferences, preparing new teaching material, and carrying out research in a number of different libraries! Here’s a quick update. I took part in Festival in the Shire, which was held in Pontrhydfendigaid, mid-Wales between 13 and 15 August 2010. I was very honoured to present a paper in the academic conference alongside such eminent scholars as Tom Shippey, Verlyn Flieger, Colin Manlove, Colin Duriez, John Garth and many others. My paper was entitled: “The Welsh Language and Tolkien’s ‘Linguistic Aesthetic’: The Appeal of Sindarin Elvish”. I also had the opportunity to present my Fantasy and Tolkien online courses at UWIC to the Festival attendees and to join in some brilliant discussions about the purpose and value of academic study into fantasy literature. 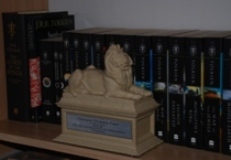 I have now also received my Aslan statue to commemorate my book winning the 2010 Mythopoeic Scholarship Award for Inklings Studies (see below for more details)! And, to make this a perfect Tolkien summer, I also managed to get organised and attend and present a paper at the annual gathering of the Tolkien Society in Oxford. This year “Oxonmoot” was held in Lady Margaret Hall between 24 and 26 September 2010, and I delivered my paper “Tolkien and the Fairies: Faith and Folklore” on the Saturday. The Sunday was also special, and I was very moved when I attended Enyalië, the TS memorial ceremony at J.R.R. Tolkien’s graveside. I am back to my lecturing duties full-time now at UWIC! Some exciting new modules I will be teaching this academic year include: Literary Transformations (Year 2, undergraduate) and Representing ‘the Past’ (Masters). ← UWIC Tolkien and Fantasy Online Courses: Enrolment open!